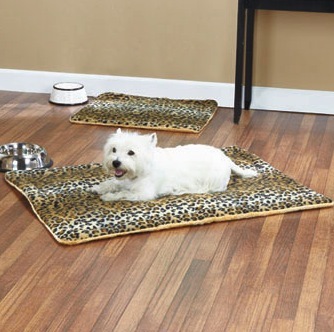 Self-warming Animal Print Thermal Pet Bed will keep your best friend cozy while indulging his wild side. A safari print covers one side of this reversible plush bed. The other features a coordinating solid color. The bed’s inner core works with your pet’s body heat to maintain a comfortable temperature and prevent cold spots that could cause aching joints, not to mention a grouchy cat or dog. Small, 19″ x 22″. Large, 28″ x 40″. Polyester with polyfill.